Display up to eight traces on screen, and perform a variety of analyses including multi-trace analysis and differential trace analysis for comparing recent waveforms with old ones, and use the 2 way trace analysis function for analyzing average values of data measured from both directions in the optical fiber. 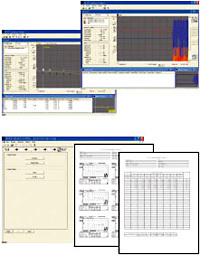 AQ7932 is application software that performs analysis of trace data measured by AQ7270, AQ7275, AQ7280, AQ1200 and AQ1000 OTDR on a PC, and creates reports. The report creation wizard function makes this task simple. AQ7270, AQ7275, AQ7280, AQ1200 and AQ1000 OTDR data can be easily loaded onto a PC using USB memory or storage function. You can edit event search conditions, approximate curve line settings, and other analysis conditions, and repeat the analysis. Operation is also easy. Simply click the function icon. By registering a comment, number of cores, Tape ID, wavelength, etc., the OTDR Project File Editor creates "File name table" called "Project". It can be used in combination with Multi fiber measurement function available on AQ7270, AQ7275, AQ7280 and AQ1200. You can compile trace and measured values from trace files and creates a report. Reports can also be created in Excel and CSV formats. Reports can be created easily by just following the step-by-step instructions in the report wizard. PC Clock speed The CPU's minimum speed 300MHz or faster. Capacity of the HDD A minimum of 20MB of free space is required for installation.